But let’s get back to the last stage of our journey. In Esztergom, lovely city, rich in history and beauty (housing a museum about the Danube too), Paolo from Bologna and Bruno & Fine from Komarno reach me. The next day, hailed by the same bright sun following us for the last two weeks (and providing warm daily temperatures), we set off. Budapest is just 70 km away. The wind is weak, so I decide that’s faster to row. I always like to start my day this way. I feel like rowing will make me earn in a fairer way the many km that I the river will gently lent me, and that it will better understand my commitment and my love for it, my respect. Sailing is wonderful, a gift that I can’t refuse: However it’s (not always) too easy. Caressing the water with the oars is a little like loving the river, also in a physical, sexual way. To all friends who come to visit me in Venice, I keep saying that you can’t understand this city unless you row, feel the water and feel all the effort by whom has carried everything across it. This way you’ll also to sense the beauty of that sweet and sensual movement where technique, lightness, fluidness, intelligence and attention overwhelm strength. We keep going for a couple of hours: The landscape is beautiful as often here. I see hills reminding me of the Wachau valley, although in a sweetest way. I meet many people aboard kayaks and canoes, very little sailboats and not so many motorboats too, commercial traffic aside (keeping within an acceptable limit). I’m happy. Lots of people greet me, some of them are stunned as always happens… “Don’t miss the art show by someone in love with you” are the words of Italian singer Paolo Conte. Clodia is beautiful. Islands, very long ones, tropical beaches, castles. 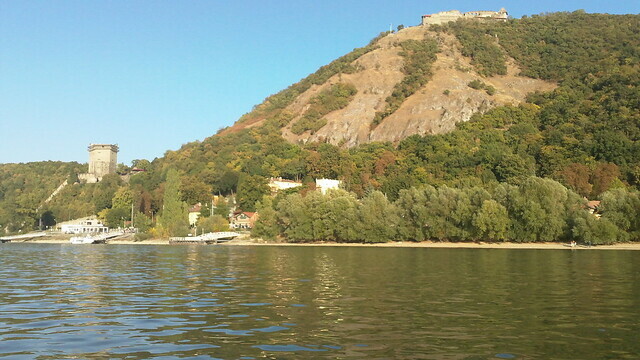 The Duna (Danube) is beautiful too. Then the river notices me and calls in its friend, the wind: I really start to enjoy my day. I’ve got plenty of time to admire the beauties of this stretch of Danube. I come across Visegrád and its incredible fortress: Genghis Khan once passed here and the building was already huge in Roman time. It’s still awesome. I see someone up there, so tiny: I hear “Giacomooooooo” and spot Bruno and Paolo filming from atop a big tower. How much effort is Paolo putting into this project, done with passion, generosity and lack of economic support. I feel ashamed of all the money that I’ve wasted in my life. In the world there’re lots of wasted resources, and so many things that can be done with little money. However beautiful things can be done with plenty of money too, quite useful ones indeed. After Visegrád, on the right we turn into a smaller canal, a natural branch of the Danube formed by the Szentendre island, stretching for a long while. You can tell that this place is lived by people with great sensibility. Nature is well respected and the banks bear no trace of rip-rap, those artificial stacks of stones used to contain the river… To kill it, maybe? After 30 km the sunlight begins to fade: On the book by Rod Heickell and on the wonderful guide “Die Donau” by Melanie Haselhorst and Kenneth Dittmann (Maritim – Hamburg, 2008) lent to me by Bernd, I see that in Dunagobody there’s a little pontoon close to a camping, where we could moor. The sunset is stunning and I take the chance to film the rite, that took place hundreds of times, of mounting our tent on Clodia. It was a great gift Mr Sacchetto from the Teloneria Mestrina of Marghera, Venice, cut and sewed (in just one day!) by using an old fabric once used for trucks coverings. Breathing, healthy and still perfectly working: What a beauty! After filming we have to get out: Not an easy task, since the pontoon’s door is closed, but we’re used to these and much bigger endeavours. In the camping we enjoy good local burgers and Soproni beer. The managers have seen us sailing and pay a few compliments, talking in English. We’re tired but happy, and sleep all night in a very quiet setting, waveless since all the commercial traffic runs on the main branch of the river. In the morning we have bread and milk for breakfast. We clean Clodia’s keel and a few huge mussels found in the water. The river is still warm: You can tell it by looking at the steam rising in the morning. Paolo comes aboard and toward Szentendre we cook mate with rice and eggs that I cool down by let them float in the river. We’re not running out of water. The island seems endless. We reach Szentendre, a Mediterranean corner along the Danube: Many Greeks Orthodox, mainly merchants, came here in the 16th and 17th century and still today you can admire their churches, museum, cemetery and a wonderful feeling. The world is made by nomads who sometime stop by to create crazy beauty, that’s much nicer and interesting than wise beauty. In my opinion, at least. The old town is nestled on a crest, a very smart move since the Danube sometimes grows higher and it’s better get off from its way. I’ve sadly watched a big rich man, boss of a tourist bar looking likewise many others (dull and costly, that are found everywhere for dull posh people with dull pricy cars), that was checking the dismantling of an awful stage built on the side of the Danube. The upper city is so much nicer, poetical, true. Thanks god, that bar is far away: Maybe one day the Danube will take care about it. 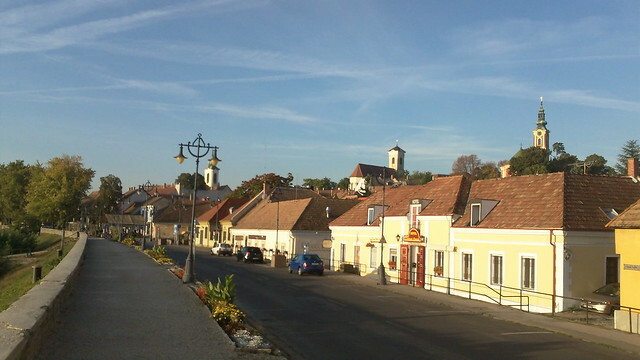 Szentendre is a nice small big city, to be lived. 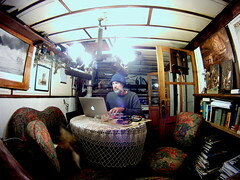 The next day we set off with Paolo still aboard, and we enjoy filming Clodia by using different cameras. The wind plays with us: From fore, from bow, from the side. The river now turns and we get back to the main branch, feeling that our forth capital is coming. Canoes, kayaks, boats of all kinds: The water and the Duna are truly loved. 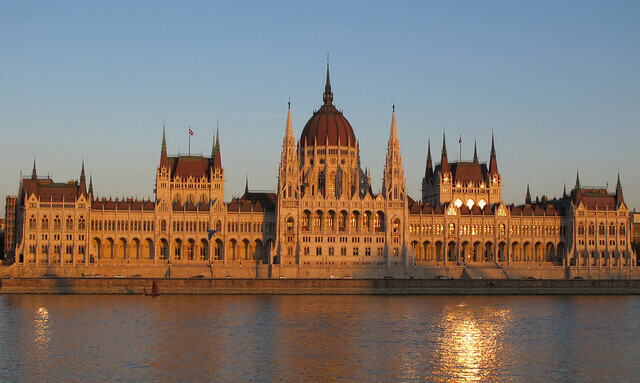 Budapest opens its arms to the Danube. What’s keeping together Buda and Pest aren’t the bridges, nor Adam Clark’s costly (at the time) chain bridge, but it’s the Danube, the Duna. Pure energy, amniotic fluid, indefinite, immense, moving placenta for this warm creature that’s Budapest. I’ve never been here but I feel at home: The Parliament is in front of me, incredibly beautiful, even funny. I arrive at sunset and I feel at home. I row upstream to get back to the marina (Wiking, for a change) and I feel at home. People smiling, greeting and dancing: The long river is lively. The Joseph and Laszlo, so friendly, pull me for a while even if I could make it on my own: Still, I feel at home. Buda or Pest, Istanpest, Budanbul, Londonbul: Where am I? 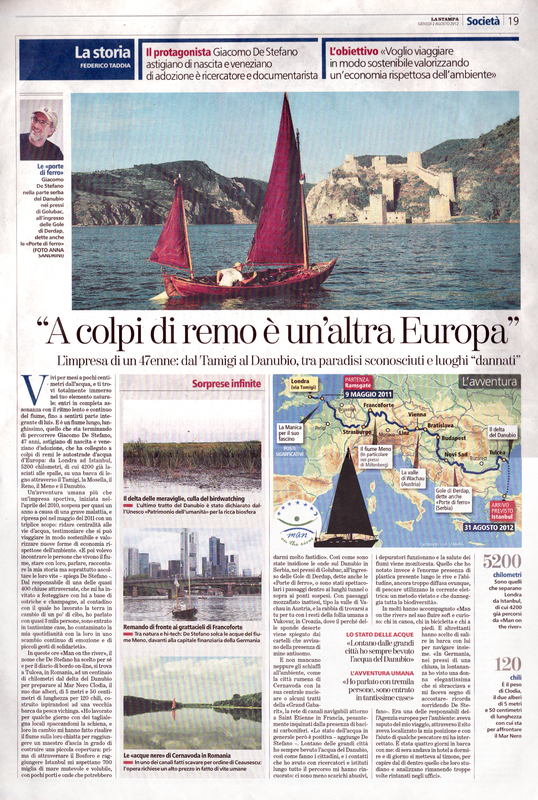 I’ve covered, we have covered, 2.600 km, 343 locks, 1.300 bridges, 8 tunnels, 1 elevator, 13 canal bridges, but what does it mean? It’s not us who make the journey, it’s the journey making us. I feel at home even if I don’t have one. 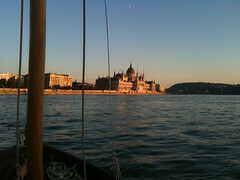 I feel well over the water and Budapest is on water: 118 springs from 17°C to 78°C. The Duna, water that unites and does not divide. I’m so happy to the point to get dumb, and very grateful to all those who have been with me even if they don’t know it. They’re me. You’re me. Budapest comes all of a sudden, after these few kilometres from Venice and from London: It seems like I’ve arrived here too fast, loosing so much even if I’ve got, seen, suffered, loved, hated (just me, that hate hating… especially the big cruise ships and motorboats that are killing the Danube) plenty. Budapest surprised me, in a sunset of sheer beauty. A guy on a kayak welcomes me. My salt water, the sea in me comes out from my eyes while I row on the freshwater that I drink from long. The river flows into the sea, then the water gets back to the river. Seas are made by rivers. All of you who have followed, supported, loved and even hated me so far. Thanks to the rivers, to the air, to the animals of the world I’ve come across and that let me through. Thanks to the water. I’ve tried to keep light. Thanks to all of you that have listened, who have dedicated a few minutes or hours to read my words. You were with me aboard Clodia. And thanks to Clodia, that’s a living creature, to the wise hands of Roland, Silvio, Nicolò and all the others who’ve built it. Also thanks to the trees that still live within my boat and tremble when the wind comes and when big and little birds settle over the masts. Grande Giacomo, via via ti si ricorda! w giacominoooooo!!! ci si vede in Laguna….. baci e in boccalupo per la tua mami! 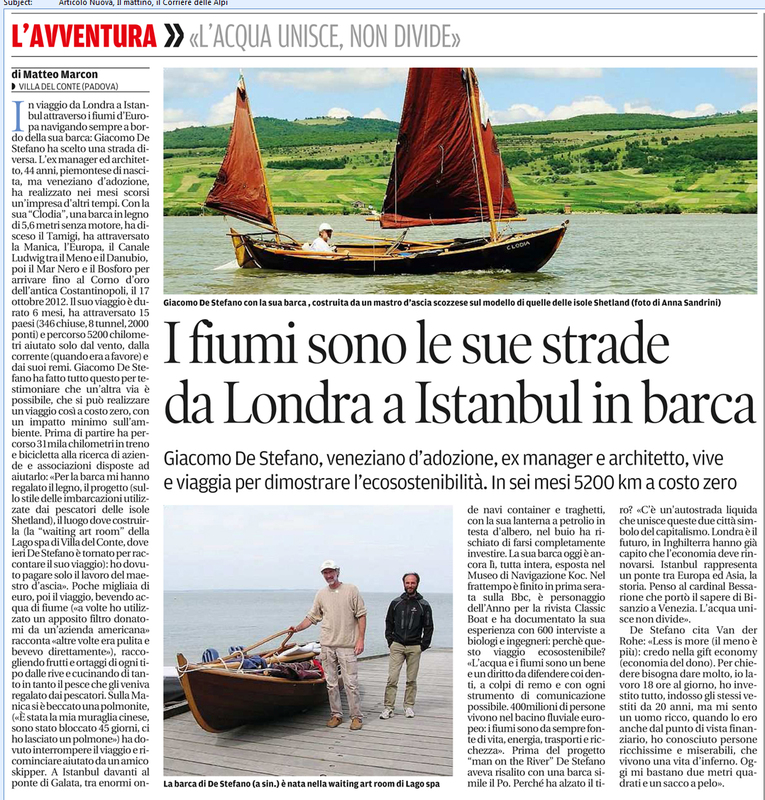 Grazie Francesco, Susanna and Molly, thank you for reading our travelog. your little sketch sits on my laptop stand – I enjoy every bit of news from the journey. 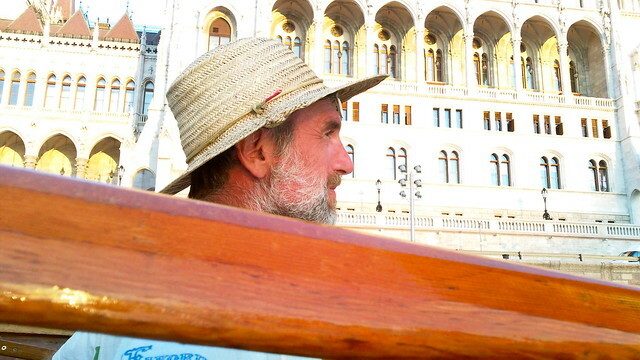 I hope we will catch up with you when we set off in spring 2012 for the Danube trip – we will tell stories of the Murray trip. Huzzah! Grande Paddy, fantastic, so much is joining us together. A super hug. Thanks for taking your time for coming to Denmark and for your interesting interview yesterday about your long journey at the rivers accross Europe at the European Environment Agency (EEA) in Copenhagen. 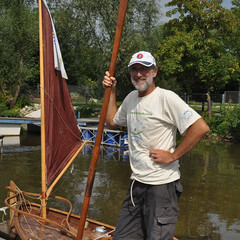 What a long journey in a small rowboat, but at the same time also an enjoyable and educational journey I understand. To meet some of the objectives 2012 UN International Year of Sustainable Energy for All http://www.un.org/apps/news/story.asp?NewsID=40951&Cr=energy&Cr1 I take the opportunity of referring to an interesting website about the use of renewable energi (sund & wind) in marine transportation http://www.solarsailor.com/ . 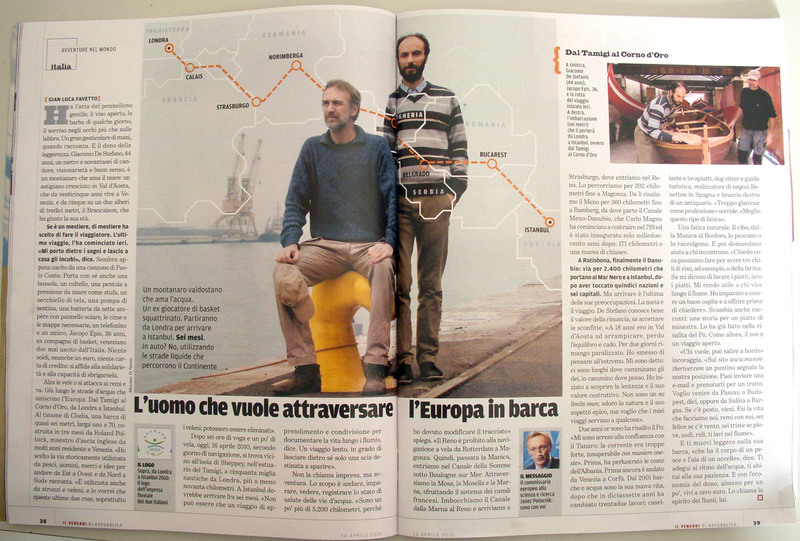 Best wishes for the remaining part of your boat trip accross Europe! cold greetings from Vienna. We miss you. Tell me please: When and from where you will restart your tour? I´m planning a private sabatical after working on the same projekt for 32 years from the beginning of may to the end of august 2012. I intend a paddeling tour to the delta, then wandering along the blackseacoast, crossing the bosporus to the marmara sea and reaching marmara island, where I have really good fishermanfriends, last seen 20 years ago. Maybe we can combine something. The idea is to combine two fo our inflatable paddelingboats to a catamaran, equiped with an Optimist rig for sailing, for crisis only, I plan to take a little outboard with me. The system shoud be also moveable as two different paddeling units. A friend of mine, living in Mexico as musician, wants to come with me, updating an old experience of making music together, whitch was interrupted 20 years ago, with his decision to emegrate to mexico. Grande Jimmy!! So nice to write to me. I really loved to be in Copenhagen. I will come back to the EEA. Your web sites are sooo interesting. I will contact the guys of the solar boat. Are you coming aboard for a leg? Thomas, thanks for your message. 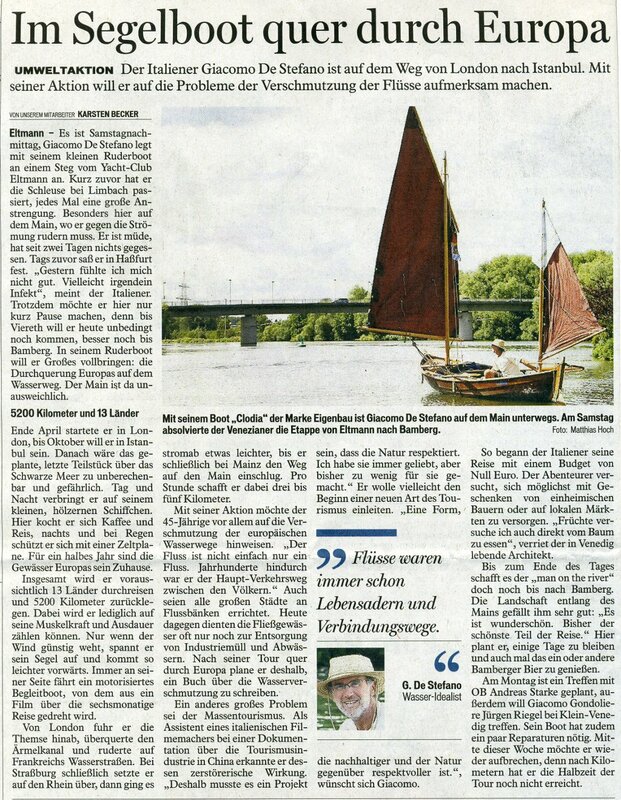 Surely we will meet in Vienna and on the Donau. I wrote you a mail.